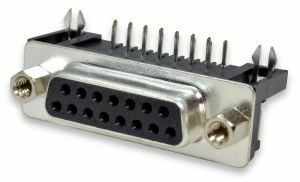 These DB15 right angle connectors are designed to be mounted on printed circuit boards. All 15 pins and two mounting tabs (locking forks) extend through the circuit board, providing a convenient and sturdy connection. These DB15 connectors have 2 rows of pins ('standard' density) rather than 3 rows of pins (high density). For DB15HD 3-row connectors, please click here.